Udupi, April 13, 2015: Presiding over Eastern celebrations organized by the PMI - Prison Ministry India and the Udupi Diocese at the District Central Jail at Anjar near Hiriyadka in Udupi district. Most Rev. 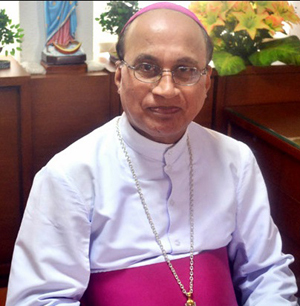 Dr. Gerald Isaac Lobo, Bishop of Udupi Catholic Diocese on April 11, said that all humans make mistakes but to correct them and change for the good is what is needed for all . Bishop Lobo added that circumstances at times forced humans to commit crimes. Locked away the prison far from worldly cares gave the offenders an opportunity to introspect and change their lives and renew them selves. Fraternity and harmony are the best for a good life. Sowmya, Superintendent of Jails, Sridhar Prabhu, Assistant Police Inspector, Gracian Buthello of Prison Ministry India, were present. The inmates showed appreciation and understanding.